It’s that time of the year again. The Ontario Hockey League playoffs are just around the corner, and quite a few of the 16 teams in it are hoping to be playing in the J. Ross Robertson Cup come May. After a busy 2017 trade deadline, some teams are on the cusp of greatness, while for others, it could be their last shot at a championship. Let’s take a look at the most enticing storylines for this year’s postseason. The Erie Otters have been a good team for a very long time. But they haven’t been able to get over the hump. Even in the days of Connor McDavid, Erie has not managed to win it all. In fact, they won their last (and only) OHL Cup way back in 2001-02. This season, they’re loaded at all ends of the rink. 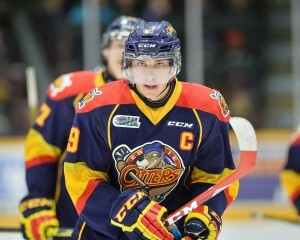 Dylan Strome finished with an astounding 75 points in 25 OHL games, while Alex DeBrincat and Taylor Raddysh were the league’s two leading scorers. DeBrincat scored a ridiculous 127 points in 63 games. On the back end, Darren Raddysh leads all defensemen in scoring with 81 points from the blue line. The Otters have been dominant for what feels like forever. This year, they’re exceptional. They finished first in league standings, and play the eighth seed Sarnia Sting in the first round. This is probably the last chance the Otters will get for a long time. Strome, DeBrincat, and both Raddysh players will almost certainly be playing in the NHL next year. Erie is the best team in the Ontario Hockey League, and now is the time for them to prove it. If they don’t, it’ll be a long time before they’re this good again. A Knights-Spitfires matchup is a dream come true for all hockey fans – except if you’re from London or Windsor. This is undoubtedly the series of the first round. Windsor will be playing in the 2017 Memorial Cup due to home-ice advantage, while London will be looking to defend its title from 2015-16. Something has to give. Tyler Parsons will be a huge factor if the London Knights hope to repeat this season. Photo by Terry Wilson / OHL Images. As good as Windsor is, they’ve struggled with injuries and underwhelming play this season. The London Knights have had no such problems; they’ve won four of their last five games coming into this series, and are much better than their fourth seeding would suggest. Even in a ridiculously difficult Western Conference, they’ve had a great season. They have four lines that can all score, excellent defence, and one of the best goaltenders in the league in Tyler Parsons. Obviously, both the Knights and the Spitfires are hoping for a deep playoff run. The difference is, the Spitfires will be playing in the Memorial Cup regardless of how this series turns out. As for the Knights, if they can’t find that extra gear, it’ll be a long offseason. This wasn’t the matchup the Knights were looking for; two more wins would have matched them up against a much easier Kitchener Rangers team. But this is a squad that won the Memorial Cup last year, and they know how to win better than any other team. This series starts Friday night at Budweiser Gardens in London, and if you’re searching for one to watch, look no further. You won’t want to miss this. At the beginning of the season, the Owen Sound Attack weren’t much to write home about. They were a solid team, but by no means elite. With the season over, they finished just one point back of Erie for first place in the league. They went on a tear in the second half of the season, that included a franchise setting 15-game win streak. Nick Suzuki headlines a youthful Owen Sound Attack. Photo by Terry Wilson / OHL Images. During that streak, they beat both Sault Ste. Marie and Windsor handily. They’re physical, fast and young, with 17 players born in 1998 or later. Their prospect pool is the deepest in the league and boasts three of the top 10 scorers in the OHL. That includes 17-year-old Nick Suzuki, Petrus Palmu, and Kevin Hancock. Suzuki and Palmu finished four and five. Michael McNiven (Montreal Canadiens, 2015) makes a strong case for the best goaltender in the OHL, and likely could be playing for the Canadiens next year. Youth could be the Attack’s downfall, but it could also take them deep into the playoffs. There’s no reason this team couldn’t upset any of the best in the West. They begin their cinderella run against the sixth-seed Kitchener Rangers on Friday night. I don’t see the Rangers giving them too much trouble, but after that, anything can happen. Along with Owen Sound, London, Windsor, Sault Ste. Marie and Erie will all be vying for supremacy in the tight West. It should be an exciting few weeks, and expect the Attack to make a splash. The playoffs are always exciting because of their unpredictability, and even more so in junior hockey, where mistakes are commonplace. One thing is for sure, though: expect some great hockey over the next few weeks. Whoever comes out of this Western Conference will be as good as any team in the CHL.